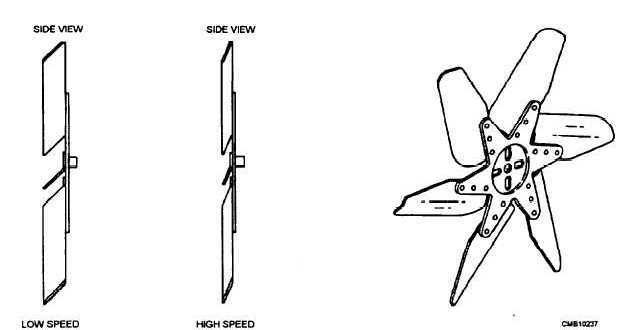 Home > Construction Training Manuals > Construction Mechanic Basic > Figure 6-9.Variable Pitch Fan. Figure 6-9. - Variable pitch fan. speed is controlled by the torque-carrying capacity of the oil. The more oil in the coupling, the greater the fan speed; the less oil in the coupling, the slower the fan speed. The thermostatic fan clutch has a temperature sensitive, bimetallic spring that controls fan action. The spring controls oil flow in the fan clutch When cold, the spring causes the clutch to slip, speeding engine warm-up. After reaching operating temperature, the spring locks the clutch, providing forced air circulation. 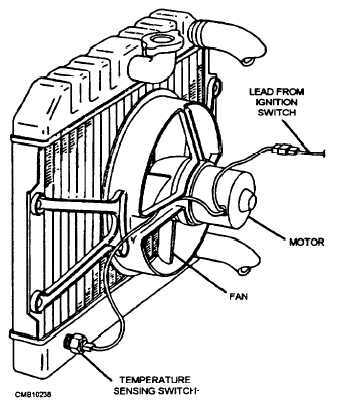 An electric engine fan uses an electric motor and a thermostatic switch to provide cooling action (fig. 6-10). An electric fan is used on front-wheel drive vehicles having transverse mounted engines. The water pump is normally located away from the radiator. The fan motor is a small, direct current (dc) motor. It mounts on a bracket secured to the radiator. A metal or plastic fan blade mounts on the end of the motor shaft. A fan switch or temperature-sensing switch controls fan motor operation. When the engine is cold, the switch is open, keeping the fan from spinning, and speeds engine warm-up. When coolant temperature reaches approximately 210F, the switch closes to operate the fan and provide cooling. An electric engine fan saves energy and increases cooling system efficiency. It only functions when needed. By speeding engine warm-up, it reduces emissions and fuel consumption. In cold weather, the electric fan may shut off at highway speeds. There may be enough cool air rushing through the grille of the vehicle to provide adequate cooling. On some models a timed relay may be incorporated that allows the fan to run for a short time after engine shutdown. This, in conjunction with thermosiphon action, helps to prevent boilover after engine shutdown. Figure 6-10. - Electrically motorized fan.